My sweet husband insisted that for my sabbatical, I should get a van or bus…..I was going to throw a tent and my bike into our little VW Golf and just go….but knowing that I’ve only camped a couple of times, and I’m not sure I ever put a tent up by myself, he saw disaster written all over it. He thought it would rain and I would give up and then be in luxury suites the whole time, therefore blowing the budget. 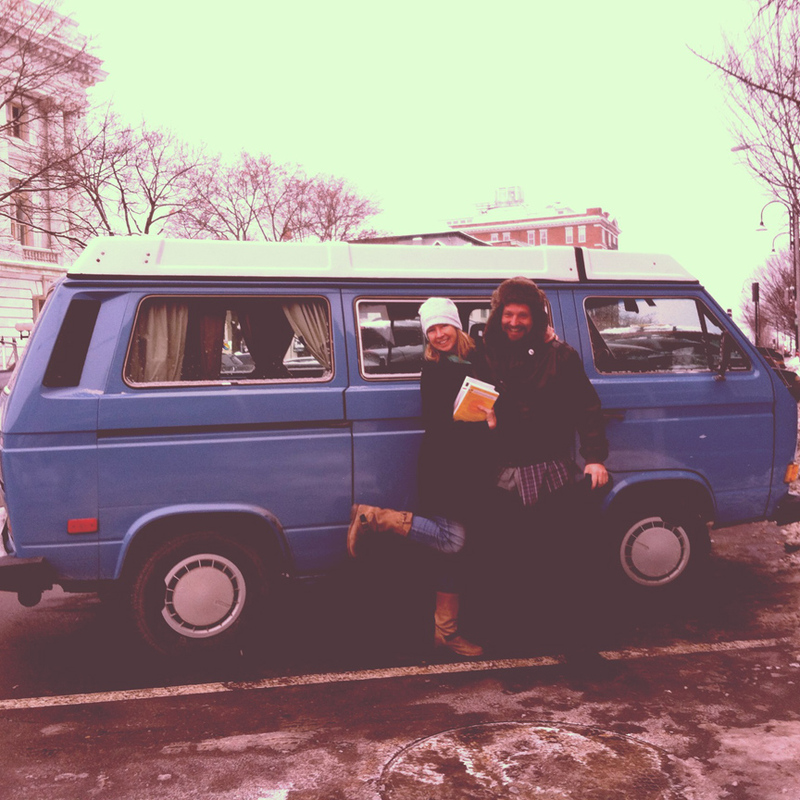 So, thank you, Lyle for being the practical one….he wrote a very funny tale of our trip to Vermont to get this beauty…in sub below freezing temperatures and with only bedroom slippers on….For his take: WESTY ACQUISITION. Tami….I’m so happy that you are taking off on a big adventure. Where do you plan to go and what do you want to do? When we did our big trip, it was so nice getting comments from people back home so I am now promising to keep in touch. I look forward to reading your blog and living vicariously through you. Sharon, not as exotic as your trip! I’ll put the towns I think I’m going to on The Plan page and ya’ll let me know if you have art stops, bar stops, camp stops, food stops! I want to do a wide variety of things, like pop into a random church or a cool bar or go see outsider art or hike a mountain or whatever I want…. I am thrilled with your adventure, and I thank you for including me on your recipient list for updates and locations. The worst thing that can happen to an adventurous soul is contentment. I am proud of you for broadening your wish list. Oh Heidi, thank you for putting such love and detail to baby blue…just learning her…I’m thankful it was owned by a woman…all the details. You’ll be on the road soon. I suspect it is in your blood!